The great Egyptologist Jaroslav Černý referred to the Topographical Bibliography as the Scotland Yard of Egyptology, where the skills of detective work were used to track down monuments and publications. The Topographical Bibliography of Ancient Egyptian Hieroglyphic Texts, Statues, Reliefs and Paintings, (also known as Porter & Moss or TopBib, as called in-house) is an essential and comprehensive reference resource for Egyptologists, presenting and analysing both published and unpublished information about ancient Egyptian monuments. The first seven volumes are arranged topographically and cover the whole of Egypt and areas beyond, including Nubia (southernmost modern Egypt and northern Sudan). Volume 8 addresses the significant body of material in museums and private collections which has no certain provenance. Published in May 2014, the current website is the digitised version of this project. The concept of a bibliography of Egyptian monuments arranged topographically was first proposed by the scholar and lexicographer Adolf Erman in the late 1890s, as a part of the scheme for the Berlin Wörterbuch. It was Francis Llewellyn Griffith, the first Professor of Egyptology at Oxford, who made the idea a reality by providing financial support and the resources of his private library. Bertha Porter, a professional bibliographer, was employed by Griffith to analyse publications. After 20 years of collecting references an additional editor was sought. Rosalind Moss, a student of Griffith’s, gave the Bibliography the structure that we are familiar with today. 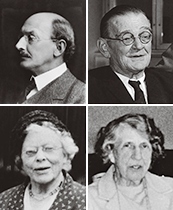 Following Porter’s retirement in 1929, Moss was joined by Ethel Burney, and they edited the seven volumes which covered the whole of Egypt, Nubia and beyond. The later editorial partnership of Dr Moss and Mrs Burney has passed into Egyptological folklore; they are affectionately referred to as the ‘Two Ladies’, in reference to the ancient Egyptian goddesses of Upper and Lower Egypt. The Two Ladies were succeeded in 1971 by Jaromir Malek who revised the crucial Memphite volume and initiated a further 8th volume series for objects of provenance not known, an invaluable and timely expansion of the project’s scope. In August 2012, the editorship fell to Vincent Razanajao, who was given the challenging task to digitize the entire Topographical Bibliography. The current website presents the work done so far with the assistance of Francisco Bosch-Puche and Elizabeth Fleming. In addition to the published volumes, a vast amount of material collected for incorporation in future revisions is available for consultation by scholars. Approximately one million references are stored on handwritten ‘Appendix slips’, waiting to be digitized and edited for the new version of the project. After almost a century of ‘analogue’ existence, only interrupted by the appearance of the word processed edition of volume 8 from the early 1990’s onwards, it has been the highest priority to digitize the vast amount of material gathered by the project whilst compiling the Topographical Bibliography (TopBib). Engaging with the heterogeneous nature of the data, from printed texts, typewritten lists and the handwritten appendix slips, as well as the complexity of the content itself, it was recognized very quickly that ‘classical’ relational databases could not fulfil the needs. The TopBib is a highly structured material compendium, hierarchically organised, yet a framework that remains intact and viable, and that turns out to match perfectly with one of the current standards already used in Digital Humanities, namely XML. The use of extensible mark-up language has been selected to digitize the content of the TopBib. This will allow us to deal with the material both at the practical, physical level—i.e. the data as strings of characters and figures—and at the content level—the data as a structured description of ancient Egypt and Nubia. Starting from the OCRed text, the plan is to apply different levels of marking up, so that the texts can be stored and displayed in digital form and then completed with meta-data. Making the most of the tree-based model of XML, it will be possible to literally explore the Nile valley and to visit an area or an archaeological site, a tomb or a temple, by following the hierarchical structure until the desired level of detail: a particular scene or inscription. XML will serve to add meta-data to place names, as well as to names, epithets and titles of kings, private individuals and deities. Crucially, it will allow the bibliography to be continually updated online. Since the digital version is closely based on the print volumes of the Topographical Bibliography, the Browse Section reproduces its structure. Access to data is granted by the left-hand menu, which reflects the tables of contents of vol. 1-7 and partly also of vol. 8. Selecting a region, a site or a part of a site in the menu will cause the related data to be displayed. Two cases are possible: either the XML version of the content is available, then an XHTML output of it is shown, or no digital version is available, then a link to the pdf is provided. Another important concept in Digital Humanities is also central to the current project: the Uniform Resource Identifier (URI). A key element of web semantics and more generally of Linked Data, the URI approach aims at assigning to any resource, real or abstract, an identifier without ambiguity. 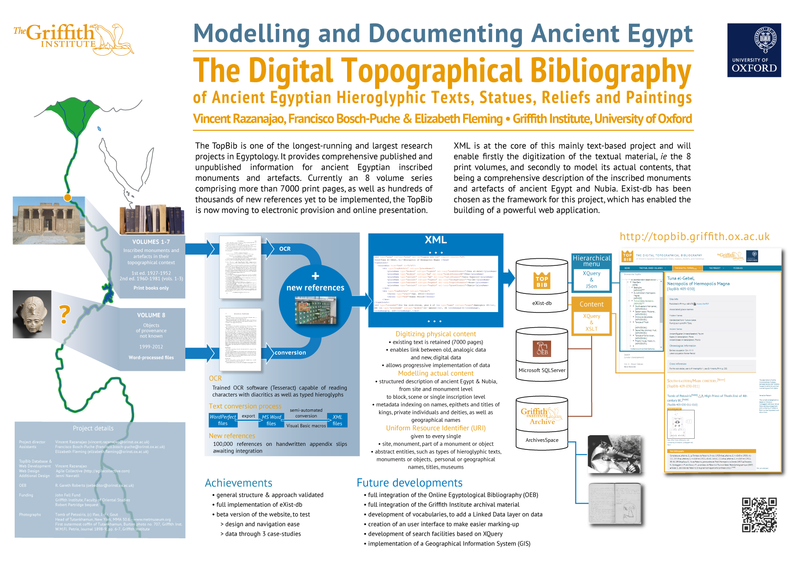 Within the framework of the TopBib, URIs will do for the digital version what the volume and page number of the published version always did: provide an authoritative reference point for every hieroglyphic text and scene in Egypt and Nubia. Thanks to the power of information technologies, this concept will be applied to all geographical areas, sites, sections of sites, monuments or sections of monuments, such as rooms, walls and scenes, as well as to any inscribed artefact. Moreover, place names, both ancient and modern, as well as personal names will also be included, along with museums, private collections and auction houses, ultimately aiming to make the TopBib a central repository for all these ancient and modern entities. This URI will expand on the 9 digit model introduced in volume 8 and will be flexible enough to allow infinite numbering. For instance, the URI of the ancient site of Tuna el-Gebel is ‘topbib-409-030’, and quoting this alphanumerical sequence is enough to refer unambiguously to the entire site. As a consequence, the URIs beginning with a same sequence pertain to the same site, thus topbib-409-030-011-010 refers to the tomb of Petosiris. The attribution of TopBib numbers to all site and sub-site level entities, as well as to monument level entities for some sections (e.g. vol. 2 on Theban temples), is in progress and will be subject of an accurate checking before version 1 of the digital TopBib is released. This numbering will be considered as definitive so that referring to sites, parts of a site or monuments within a site currently implemented in the Topographical Bibliography through their TopBib number will be possible and guaranteed valid in the future, regardless of forthcoming additions and corrections. Building on the experience, indexes, and various lists compiled throughout its long history, the project will implement a set of digital vocabularies and indexes to enable a precise, unambiguous labelling of the many entities forming the Digital Topographical Bibliography. In the first instance, there will be the museum, private collection, and dealer lists that have been compiled by the project for many decades to serve as supporting documentation essential for tracking the provenance and history of ancient Egyptian artefacts. This will build a database of repositories with Egyptian collections, from major national museums to small local institutions, and will also provide an extensive list of private collections and dealers, which have played and continue to play an important role in the circulation of ancient Egyptian artefacts in modern times. The second central set of terms that will need to be developed are vocabularies aiming at assigning precise designations to monuments, parts of monuments, texts, scenes, and artefacts included within the project. On the one hand, this will give the Digital Topographical Bibliography the requisite consistency for precise and extended data mining, in which complex queries could be performed by selecting terms in hierarchal lists. On the other hand, this will enable external databases and documentary projects to be linked to the TopBib, and vice versa, since the establishment of such lists will enable indirectly connected research projects to understand each other and interact. This will build on and expand from past and current Egyptological as well as cultural heritage related projects, in which such approaches are already in place and have yielded significant achievements (Multilingual Egyptological Thesaurus, Meketre Project, Thesaurus Linguae Aegyptiae, etc. ), and will require the implementation of concepts developed by linked data and web semantics fields, as well as adopting what information sciences refers to as ontologies. Ontologies may be defined as structured sets of terms and concepts aiming at providing a comprehensive and organised representation of a specific domain. In the perspective of the Digital Topographical Bibliography, the work will focus on four main axes, namely archaeology, architecture, epigraphy, and iconography. As with the entities from the core data, each item from these vocabularies and lists will be given a TopBib number, so that they can be referred to unambiguously as a URI both internally and by external projects. Along with the digitization, conversion, and XML mark-up of the print volumes, the work on ontologies can be considered the cornerstone of the new developments of the almost hundred-year-old Topographical Bibliography, as well as the prerequisite for its digital transformation. Developed by Vincent Razanajao, this website is powered by Exist-db, a native XML database and all-in-one solution for application building. It is hosted on the servers of the Faculty of Oriental Studies, University of Oxford. The website has been designed by Agile Collective, thanks to funding from a generous bequest by Robert Partridge (1951-2011). Current version 0.9 has been mainly tested on Google Chrome and Firefox, though some bugs still remain. Other web browsers will be considered soon.